Get Acquainted Question: What are you looking forward to about eternity? Not looking forward to? I’ve changed the title for today’s message to “Parables of Judgment.” As I got deeper this week into the two or three parables I was going to teach on today, I realized that more of Jesus’ parables have to do with some form of eternal judgment than any other singular topic presented in the parables of Jesus. And I must admit that I find this topic far more challenging and difficult than, say, teaching parables about stewardship or love of neighbor or prodigal sons/daughters. We judge whether it is safe to step off the curb into the street every time we must cross a street. We judge at the beginning of the day whether getting out of bed when the alarm goes off is the better thing to do than sleeping in. We judge whether or not a person is someone we should hug or cross the street to avoid. Just this morning you made dozens of judgments that ultimately brought you to this place and the very chair you are sitting in. Those same sorts of “judgments” are what has led most people in Spokane not to be in a gathering like this today…or any day of the week. Judgment is far more a part of our daily routine than eating or sleeping or talking. It shapes virtually every one of the thousands of decisions we make in a day. Making judgments and judging our own and other’s decisions is written into the DNA of every day of life! 2 Corinthians 5:9, 10--9So we make it our goal to please him, whether we are at home in the body or away from it. 10 For we must all appear before the judgment seat of Christ, so that each of us may receive what is due us for the things done while in the body, whether good or bad. Hebrews 6:1, 2-- Therefore let us move beyond the elementary teachings about Christ and be taken forward to maturity, not laying again the foundation of repentance from acts that lead to death, and of faith in God, 2 instruction about cleansing rites, the laying on of hands, the resurrection of the dead, and eternal judgment. Hebrews 9:27, 28-- 27 Just as people are destined to die once, and after that to face judgment,28 so Christ was sacrificed once to take away the sins of many; and he will appear a second time, not to bear sin, but to bring salvation to those who are waiting for him. That is but a brief smattering of some of the very clear N.T. teachings about the fact that everyone who has ever lived, Christ-followers and non-Christ-followers, will be accountable to God for how we have and are living out life. Revelation 20 speaks of BOTH believers in Jesus whose names are written in the “book of life” and those who have rejected Jesus, whose names are not and who will be judged based on their works. It says, 11 Then I saw a great white throne and him who was seated on it. The earth and the heavens fled from his presence, and there was no place for them. 12 And I saw the dead, great and small, standing before the throne, and books were opened. Another book was opened, which is the book of life. The dead were judged according to what they had done as recorded in the books. 13 The sea gave up the dead that were in it, and death and Hades gave up the dead that were in them, and each person was judged according to what they had done. 14 Then death and Hades were thrown into the lake of fire. The lake of fire is the second death.15 Anyone whose name was not found written in the book of life was thrown into the lake of fire. 1.) That you and I will have some sort of transformational encounter with God. 2.) That those encounters will convince us of God’s truth and change the way we live every week. 3.) That those changes we enable us to bring glory to God and blessing to us and everyone around us. a.) the condition of your heart and mine as we are here. b.) the way in which I help you engage with God in His Word. So because of the theme of today’s parables (i.e. judgment), I’ve decided that preaching AT you is probably not the best way for the Holy Spirit to encounter you today. I think different groups wrestling with different parables of judgment and then discussing them together may be a better way for God to encounter us today. 1.) Get into groups of 5-7 people. 2.) I’ll give each group one parable of judgment. a.) What does this parable teach about the judgment of the righteous? b.) What does it teach about the judgment of the unrighteous? c.) Since that is true for both groups of people, how should that change the way we live this week and beyond? What steps could we take to effect that change? I’ll give you a good 10 minutes to discuss all that. [Hand out the following passages.] GO! So now let’s think and talk about WHY we tend to resist this concept of divine eternal judgment. What is it that bothers us or makes it difficult for us to really embrace these truths and change our behavior? Why do we more often than not live as if this fact of eternal judgment… as clearly stated as any by Jesus…is not actually true? It’s not the reward side of eternity we have much of a problem with, is it? It is the eternal judgment side that bother’s most of us, right? And just what about eternal judgment bothers us? That it involves such deep suffering. That it involves people we know and love. That we, in our imperfect compassion, don't want anyone to have to experience eternal separation from God. How could God? What makes us think that more time with more evil and more suffering will make more people want to submit to God? What in human history or nature supports that? Isn’t this world the very kind of experience/place that we think would naturally lead people to choose God and reject evil? It is a mixture of both, designed to lead us to God… yet so many still refuse God’s free and grace-filled offer, choosing their rebellion and sin over God’s forgiveness and righteousness. That tells us something about human nature apart from a divine work of redemption, reconciliation and rebirth. Hell is simply the logical and ultimate destination of people in rebellion against God. They would HATE heaven unless born again spiritually. Hell will not be the same experience for every lost person…just as heaven will not be the same for every saved person. God has even greater compassion than we do as He doesn't desire that anyone should perish but that all would come to repentance (2 Pt. 3:9). Desire and reality often conflict. 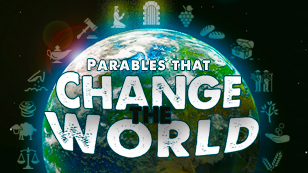 So now we come to the hardest part for all of us: Since what Jesus told us in these parables IS true for both groups of people (righteous and unrighteous), how should that change the way we live this week and beyond? What steps could we take to make those changes? Choose NOW to be a part of God’s eternal kingdom. Respond to His offer of eternal life with him now and begin the journey into holiness and righteousness. Live radical lives of FAITH that adjust this life to the realities of the next. Truly bank on what Jesus promises will happen and make daily decisions/judgments that will, in hindsight, look completely rational and right but, in the present, require faith. calling others to be prepared for that same reality. Design ways to be reminded of and think more deeply and frequently about the REWARDS God has for all who live by radical faith. Take advantage of more OPPORTUNITIES to SHARE the Gospel of Jesus with others. Camping with Changing Lives this next weekend; with Mosaic in late August…and inviting unsaved friends to join us. Inviting people to church. Make a list of 4-5 people God has put in your path that you want to invite to some spiritual event before the end of this year…and pray regularly for them. Praying with people as we have opportunity. APP: Choose at least 2 of these options…and determine, by the grace of God, to work on them and be accountable to someone else for them over this summer and fall.